Last SOPHIE newsletter, now available! We are happy to announce the launch of the last newsletter of the SOPHIE project. Find the SOPHIE Conclusions Booklet. Meet all the people behind the project in our collection of pictures, and read the interviews with the SOPHIE Principal Investigator, Carme Borrell, and the Project Manager, Davide Malmusi. Finally, have a look at our recommended readings. We hope you enjoy the reading! New video: "Access to housing and health"
We are proud to release our new and last video of the project. The short video "Access to housing and health" reports how housing-related problems, such as living in inadequate housing or struggling to pay their rent or mortgage, affect people's health, and how interventions that increase housing affordability can improve it. We would like to thank the collaboration of ObservatoriDESC, Càritas and La PAH in our studies and their participation in the video. The video is based in the following publications: "Foreclosure and health in Southern Europe: results from the Platform for People Affected by Mortgages", "Emergencia habitacional y derecho a la vivienda en Cataluña. Impacto en el derecho a la salud y en los derechos de la infancia en la crisis hipotecaria" and "Canvis en l'habitatge i salut en població vulnerable". We invite you to watch and share the video, which is also available in Spanish and Catalan. Hope you find it interesting! 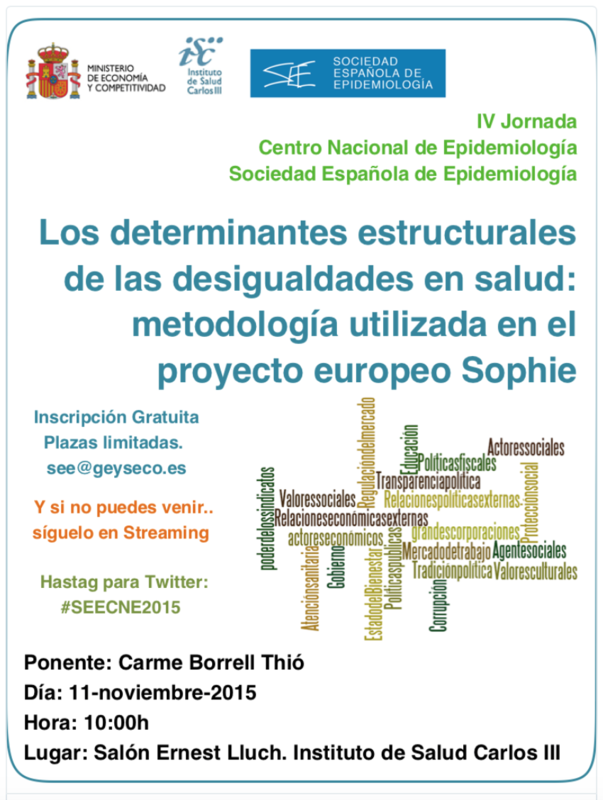 Our PI Carme Borrell was invited to present the methodology of the SOPHIE Project at the IV Joint Meeting of the National Centre for Epidemiology and the Spanish Society of Epidemiology (CNE-SEE), in Madrid (Spain). The presentation "Structural determinants on health inequalities: methods used on the SOPHIE project" explained some of the innovative methods we used, through examples from specific studies in the field of Housing and Built environment. The meeting was transmitted through the Youtube channel of the Sociedad Española de Epidemiología (SEE) and it was highly followed on Twitter through #SEECNE2015. On our Storify, you can have a look to all the tweets produced during the session. The full summary of results is collected in the Conclusions of the SOPHIE project document. 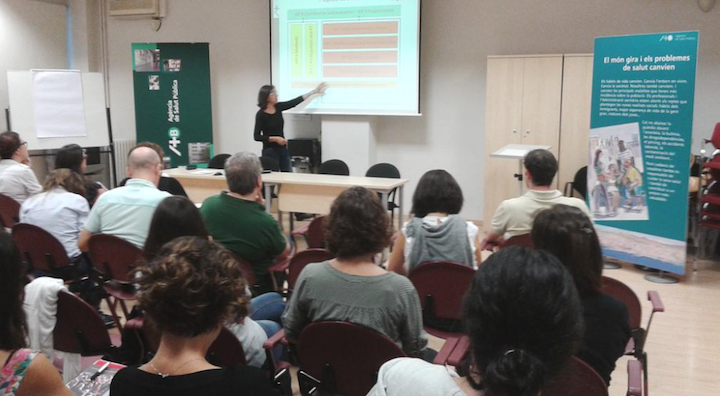 "Urban planning, housing and health inequalities"
On 8th October 2015, we organised our last event "Urban planning, housing and health inequalities", where the research teams from Barcelona (Agència de Salut Pública de Barcelona, Càritas Diocesana de Barcelona and Universitat Pompeu Fabra) presented and discussed with invited experts some of the main findings of the work package 4, which integrates "Housing" and "Built environment" studies. The programme included the following panels: Health inequalities in the city of Barcelona and the impacts of urban regeneration; Fuel poverty, housing retrofitting and health; and Housing emergency and health. On our Slideshare page, you can find the slides that summarize the results of the works presented. The full summary of results is collected in the Conclusions of the SOPHIE project document. Moreover, you can have a look to our new Storify, that summarizes the event through the tweets produced during the session. The event "The impact on health and equity of social and economic policies" took place on 29th September in Brussels. There, we presented and discussed the main findings and conclusions of SOPHIE with members of the European Parliament, European Commission and Civil Society Organisations. We would like to thank the co-hosts, chairs and discussants for making possible the event. On our Slideshare page, you can find the slides that summarize the results of some of the SOPHIE thematic areas presented: urban environment, housing, crisis, austerity, welfare, employment, and gender. The full summary of results is collected in the Conclusions of the SOPHIE project document. On the eve of our final conference, we publish "Social and economic policies matter for health equity", the document that summarises the main findings and policy implications of SOPHIE. Over the past few years, SOPHIE has accumulated evidence regarding the influence of social and economic policies on the health of the population and on social inequalities in health. At the same time, SOPHIE has shown how equity-oriented policies can ameliorate these health inequalities. These studies can help public health and social justice advocates build a strong case for fairer social and economic policies. In this event, co-hosted by GREDS-EMCONET and ASPB, we presented and discussed the findings of SOPHIE in some of the thematic areas covered by the project: macroeconomics (economic cycles, austerity policies), social protection (unemployment benefits, family policies), labour market policies and employment relations, gender equity and immigrant integration. On July 1, we presented results on gender, the economic crisis, austerity and migration. On July 2 and 3, the focus was on employment and labour market policies. Here you can find the full program. If you missed the sessions, in this Storify chronicle you may find links to the slides presented, some of the discussions around them and some press impacts. We would like to thank to all participants for making possible this interesting meeting! Final events, save these dates! As we approach the end of the project, we are organising several events to present our main results, conclusions and recommendations to a wide audience. 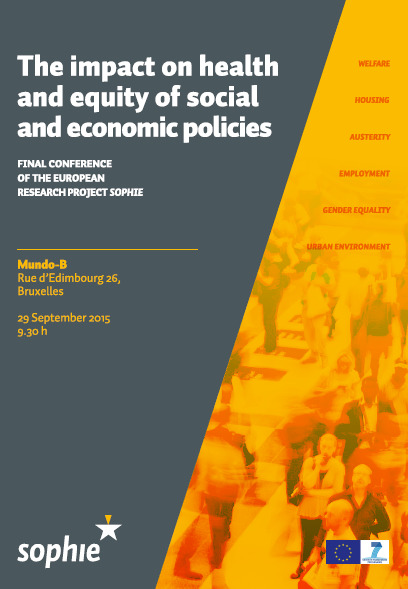 An important date to mark in your agendas is the 29th of September, to attend the final conference of SOPHIE, "The impact on health and equity of social and economic policies", that will take place in Brussels. We will gather members of European institutions and civil society organisations to present our findings on selected topics and raise a discussion on political solutions. Besides, we will organise two public events to present the project results in Barcelona. 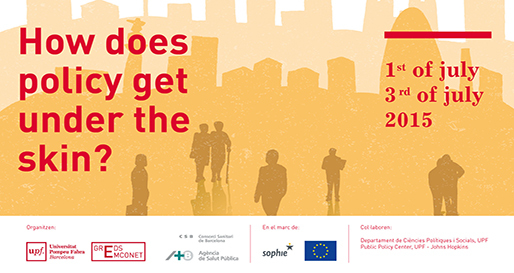 The first will take place from the 1st to 3rd of July, focusing on "Employment conditions, austerity and equality policies as determinants of health inequalities in Europe" and counting with presentations from several SOPHIE partners. On July 1, we will present results on gender, the economic crisis, austerity and migration. On July 2 and 3, the focus will be on employment and labour market policies. The second will be held in October and will focus on our studies in the fields of urban environment and housing. Please revise the meeting pages and follow our Twitter account for updates on the program and inscriptions. 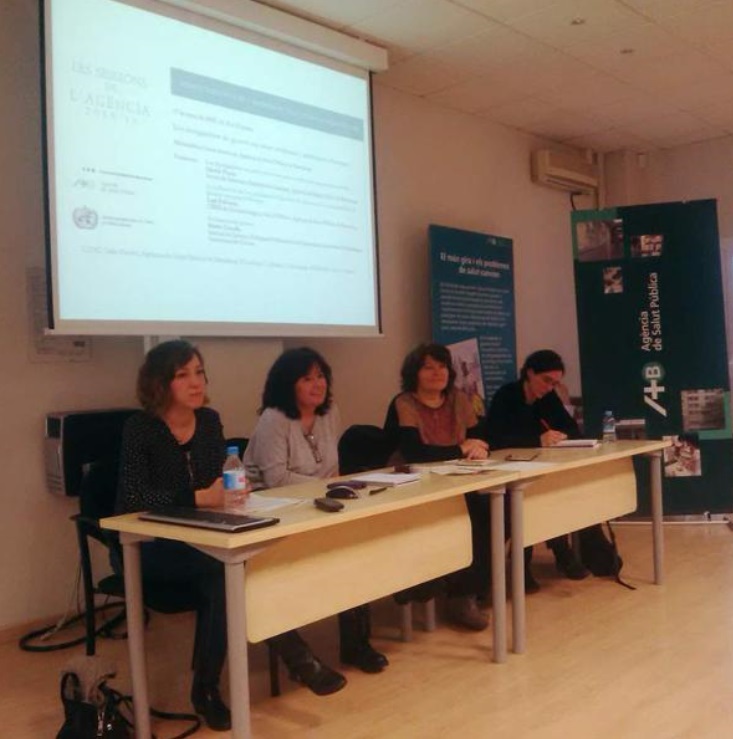 Some members of the SOPHIE project team presented their work on the debate session "Gender inequalities in health: evidence and policies in Europe" organised by the Agència de Salut Pública de Barcelona (ASPB). The session was moderated by the researcher Lucía Artazcoz, and the researchers Glòria Pérez and Laia Palència presented some results and conclusions of their studies on family policies and health of lone mothers in Spain, and the gender inequalities in health according to the family policy models in Europe, respectively. Finally, Marta Cruells, from the Institut de Govern i Polítiques Públiques de la Universitat Autònoma de Barcelona, discussed about the evolution of gender equality policies in Spain and worldwide since the 1995 UN Women conference. If you missed out the session, you can have a look to our new Storify that summarizes it through the tweets produced during the session. New video: "Gender equality and health"
We are glad to share with all of you the launch of our second video "Gender equality and health". This new short video shows how more or less equality-oriented family policy models are related with lower or higher gender inequalities in health. 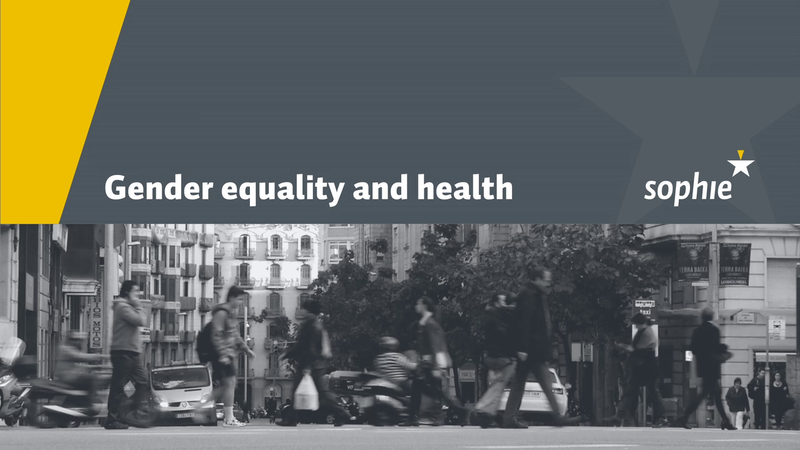 It is based on our studies "The influence of gender equality policies on gender inequalities in health in Europe" and "Contemporary employment arrangements and mental well-being in men and women across Europe: a cross-sectional study". We hope you find it interesting! We are happy to announce the launch of the third number of the SOPHIE newsletter. Look at our two new infographics "Immigrants' health and integration policies in Europe" and "Gender inequalities in health: a matter of policies". Find two new open presentations on "The Method" and "Results" sections, and the analysis of "The Picture" and "The Number". Meet two SOPHIE researchers on "People" or keep up-to-date of our news and recommended readings. If you do not want to miss our updates, you can subscribe to our RSS channel or to receive by e-mail our periodical updates (max. 6 per year). New SOPHIE dissertation, congratulations Dr. Kramer! We would like to congratulate our colleague Daniëlle Kramer for obtaining her PhD degree. She defended her PhD dissertation on "Promoting physical activity: the role of neighbourhood safety and renewal of deprived areas" on November 12nd at the Universiteit van Amsterdam, in Amsterdam. The dissertation builds on studies that Daniëlle performed in the projects URBAN40 and SOPHIE. Her doctoral thesis supervisors have been Dr. Karien Stronks and Dr. Anton Kunst. A summary of her dissertation is available here. Congratulations and good luck in your career! After a fruitful time at the 7th European Public Health Conference in Glasgow, we have prepared some resources to summarise our participation in the meeting. We have created two Storify stories with all the tweets generated during the pre-conference "How to tackle health inequalities? Results from four EU-funded projects" and the plenary session "Inequalities in the population: large scale interventions" both with participation from SOPHIE. Also, you can find here all our presentations and posters during the conference. We are exploring different ways to approach our research to stakeholders, presenting our results and conclusions in a more visual and practical manner. We would like to invite you to have a look to our first infographic and policy brief based on the article "Immigrants' health and health inequality by type of integration policies in European countries", recently published in the European Journal of Public Health. We welcome your feedback on these two new tools! 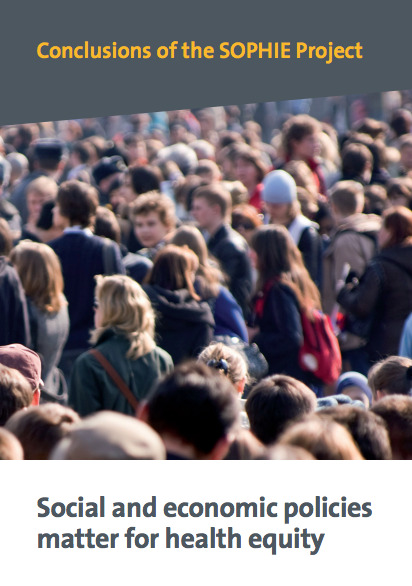 Registration has opened for the 7th European Public Health Conference: "Mind the gap: Reducing inequalities in health and health care" that will be held in Glasgow, Scotland, UK, from 20th to 22nd November 2014. We will present some of our results at the pre-conference: "How to tackle health inequalities? Results from four EU-funded projects" on Thursday 20 November 2014, 08:30-12:00. The pre-conference will show the results of four large projects founded by the European Union. These projects aiming to generate new evidence on what works to tackle health inequalities are DEMETRIQ, DRIVERS, SILNE, and SOPHIE. You can register to the pre-conference when registering to the full conference: there are 100 places available for a fee of 20€ including buffet lunch and refreshments. Moreover, Carme Borrell, principal investigator of SOPHIE, has been invited at the plenary session "Inequalities in the population: large scale interventions" on Thursday 20 November 2014, 17:15-18:15. Other SOPHIE members will present their work in several oral and poster sessions. The full programme of the conference is available here. Follow the conference updates on Twitter @EPHconference. Find here the detailed information about our communications (speakers, data and location). Also, there are 20 extra places available for our joint preconference. Book your place! It is not necessary to register to the full conference. We are happy to announce the launch of the second number of the SOPHIE newsletter. From our previous newsletter, one year ago, SOPHIE has not stopped growing! Watch our new video "Urban renewal and health" or discover how SOPHIE project is expanding its presence in different social media. Find two new open presentations on "The Method" and "Results" sections, and the analysis of "The Picture" and "The Number". Meet two SOPHIE researchers on "People" or keep up-to-date of our news and recommended readings. Finally, if you do not want to miss our updates, you can subscribe to our RSS channel or to receive by e-mail our newsletter and periodical updates (max. 6 per year). We would like to congratulate our colleague Roshanak Mehdipanah for obtaining her PhD degree. She defended her PhD dissertation on "Urban renewal and health: effects of the Neighbourhoods Law on health and health inequalities in Barcelona" on May 23rd at the Dpt. Experimental and Health Sciences of the Universitat Pompeu Fabra, in Barcelona. The dissertation is based on the studies performed within SOPHIE and evaluating the Llei de Barris and inspired our last video. Her doctoral thesis supervisors have been Dr. Carme Borrell (ASPB) and Dr. Carles Muntaner (CRICH). The members of the committee were two members of the SOPHIE Advisory Board, Drs. Hilary Thomson and Joan Subirats, together with Dr. Núria Calzada. Her presentation is available in our slideshare account. Congratulations and good luck in your new career as a postdoctoral researcher, Dr. Mehdipanah! We are glad to share our article "The effects of an urban renewal project on health and health inequalities: A quasi-experimental study in Barcelona" published today in the Journal of Epidemiology & Community Health. 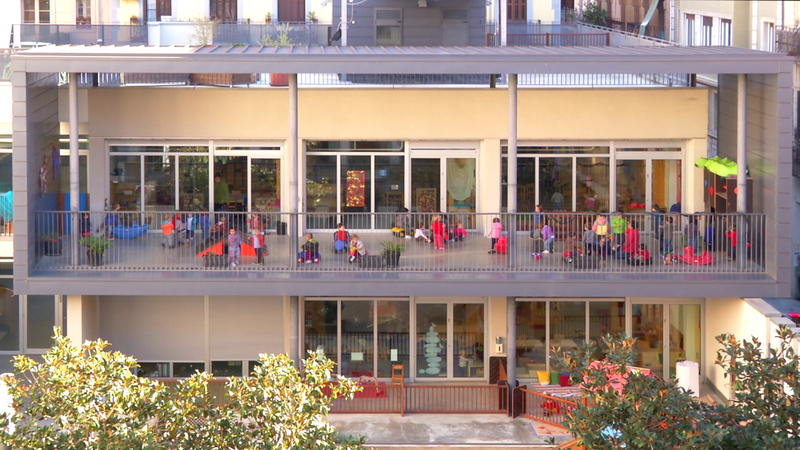 Also, we invite you to watch a short film we have prepared on the Neighbourhoods Law and its effects on health and health inequalities in Barcelona, Spain. The video is also available in Spanish and Catalan. You can also find more details on the whole mixed-methods evaluation of this policy in this presentation. Feel free to share the video and follow our latest news on our Twitter account! Last week some members of the SOPHIE project team presented their work on "Housing and health" in the last open scientific debate "Les sessions de l'Agència" in Barcelona. The researchers Ana Novoa and Lluis Camprubí (ASPB) presented some of the latest results of the SOPHIE project related to impacts of housing policies and conditions on health inequalities. Ada Colau, from the civil society organisation Plataforma d'Afectats per la Hipoteca (PAH) discussed about the increasing social problems caused by unpaid mortgages in Spain in the last years; and finally, Carme Trilla, responsible of Social Action of Càritas Barcelona, talked about the increasing number of people unable to afford housing costs, and the problem of tenants' eviction and how new government policies make them more vulnerable. Last week we held the mid-project meeting of all SOPHIE partners in Barcelona. A total of 34 researchers participated in the sessions. Besides reporting on general advances, partners presented and discussed 23 working papers, which will certainly make up the bulk of the final project publications. A nice strategy to improve interaction has been to have all participants peer-reviewing one of the working papers sent before the meeting. It has been a very fruitful exchange! In the SOPHIE in the news section you can find a selection of the coverage that our two January press releases have received in some of the most read Spanish newspapers. 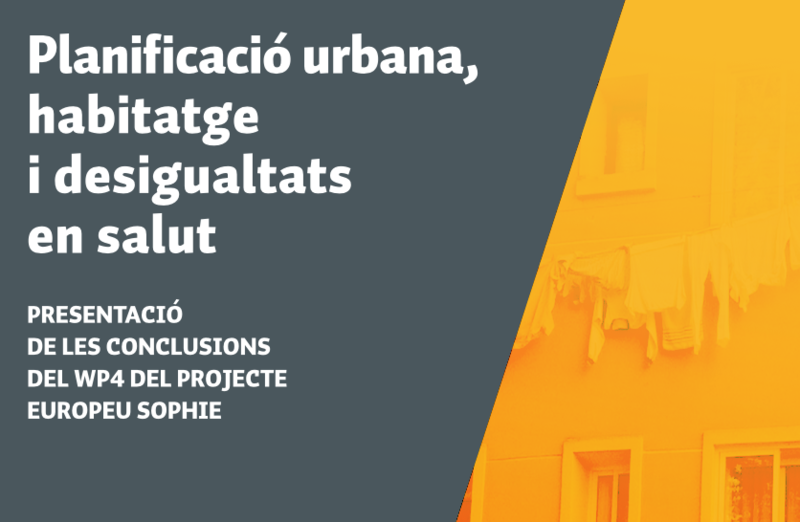 This week, Càritas Barcelona has published a report on housing conditions and health of people served by this NGO, prepared together with Agència de Salut Pública de Barcelona as part of a SOPHIE case study on housing. Results were presented in a press conference along with preliminary data on 2013 Càritas social action, and was extensively covered by the press. The full report on Càritas housing actions and the SOPHIE housing and health study is available on the Càritas website. The housing and health study (including an executive summary in English) can also be downloaded here. At the end of this month, we will reach two years since the start of SOPHIE, that is, the half of the project. During these years we've been setting the basis of our research work and results. We gained experience in innovative methods and discussed our plans between project partners and with our Advisory Board. We have opened this website and a twitter account. We've launched our first press release, newsletter and video, and we've presented our first publications. Finally and most importantly, we've been working on many more publications and getting in touch with several stakeholders. We are sure that the next two years will be surprising! We will be able to present most of our results, and we hope it is evidence that will make a difference in our understanding of what works to reduce health inequalities and that will foster policy change at all levels. From October 1 to 3, 22 researchers from seven project partners and five countries met in Barcelona to participate in an advanced training on two of the innovative methods inspired in the realist philosophy of science that we are applying in SOPHIE: realist review - especially realist synthesis - and explanatory case studies. The training was conducted by our partner CRICH researchers and staff with experience using these methods (Patricia O'Campo, Carles Muntaner and Alix Freiler). The researchers attending were those that had already started or were soon starting to use one or both of these methodologies, and was designed to combine theory with several practical aspects of the method application, giving large room to exercises and team-level discussion of how to apply them in each single project. We also started to set the basis for a multi-country case study on social protection policies. From May 29 to 31, the Steering Committee of SOPHIE met in Amsterdam. The first day was dedicated to a meeting with our Advisory Board to discuss the project plans.The advisors, who had previously received a 58-pages summary of the project plans, generally praised the project ambition, as well as some of the specific topics and methods chosen. They also expressed several concerns and suggestions, such as considering for some topics a narrower focus on specific vulnerable groups, a better integration of case studies, or the use of further innovative methods. Thanks again to the advisors who could travel to meet us in Amsterdam: Martin McKee, Mary Daly, Jacqueline O'Reilly, Hilary Thomson, Karen Croucher, Mona Backhans, Sijmen A. Reijneveld, Joan Subirats. We have updated the Themes pages with more information on the specific studies that we are carrying out. The lists of accepted or published articles and conference communications have also been updated. We are happy to announce the launch of the first number of the SOPHIE newsletter. Watch our welcome video and discover all its sections: the Method, the Results, the People, the Picture, the Number, News and Readings. A new SOPHIE publication is available: an article published in the journal Health & Place, using one of our innovative methods to understand how an urban renewal program can improve the wellbeing of residents. We also uploaded a presentation to explain its main results. Find out more here. On May 29-31 we will meet in Amsterdam to discuss our advances. The first day, we will have the opportunity to discuss our project with the members of our Advisory Board, each one specifically expert in the nine thematic areas of SOPHIE, but also with a global vision on the issue of health inequalities and how they can be influenced through policy. The Advisory Board members are: Martin McKee, Mary Daly, Jacqueline O'Reilly, Hilary Thomson, Karen Croucher, Mona Backhans, Sijmen A. Reijneveld, Mike Kelly, Joan Subirats and Vicente Navarro. We are grateful to all them for accepting the invitation! On January 21-22, we participated in the periodic meeting of the Expert Group on Social Determinants hosted by the European Commission DG Health & Consumers. We presented the SOPHIE project, giving some examples of the policies that we are evaluating and of the methods that we are using. You can watch and download our slides here. While working on the first project publications, recently we started on our Twitter account a new article of the week section on recommended papers on social policy and health inequalities. These articles will bring already published examples of how living conditions influence people's health and how structural social and economic policies can make a difference to health inequalities. You can start following us there and each Wednesday morning you will find a new suggested reading. During this spring and summer we have been advancing in the definition of the specific studies that will finally make up SOPHIE. On September 27-28, work package leaders meet in Barcelona to debate and coordinate their respective research protocols. Taking the opportunity of this important meeting, we have prepared, with the collaboration of the CommHERE project, our first press release to present the project that you can read and download here. We have also produced and printed a SOPHIE leaflet that you can see online here. Reading these documents, you will find new details about some methods that we are going to use and some specific policies whose health effects will be evaluated. sophie-project.eu , the website for our SOPHIE project, is now online! SOPHIE aims to generate new evidence on the impact of structural policies on health inequalities, and to develop innovative methodologies for the evaluation of these policies in Europe, putting particular attention in increasing the involvement of stakeholders affected by health inequity. In the website you'll find basic information about project themes, partners and main objectives. The project started in November 2011. We are now preparing the protocols of all studies, and have started the fieldwork in some of them. By the end of the year, more information will be available on the scope, methods and when possible preliminary results of these concrete studies. On February 6 to 8, in a frozen Brussels (-10ºC to -5ºC), 29 researchers from the 12 partners of the project met for the first SOPHIE consortium meeting. The preliminary plans of all Work Packages were presented and discussed. We had discussions on how to make the link between social and economic policies, social determinants of health, and health inequalities, and on how to apply realist methodologies for the review and evaluation of policy impacts on health equity. The next venue will be Barcelona, September, for a meeting of Work Package leaders. On November 2011, 7 to 9, 15 researchers from 6 partners of the project met in Barcelona to attend a training in Concept Mapping, a participatory, semi-quantitative method to involve stakeholders and gather their views on an issue of interest. Our partners from the Centre of Research in Inner City Health (CRICH) in Toronto, Mairi Omand from CRICH Survey Research Unit and Pat O'Campo, CRICH Director, prepared the training and shared with us their large experience with this methodology. Last month we started using it in Barcelona in a study on the health impacts of a neighbourhood renewal program, and we hope to be able to apply it soon in other countries!